Things continue to evolve in the Macbook space and now, for certain models, the hard drive is soldered onto the mainboard of the Macbook itself. 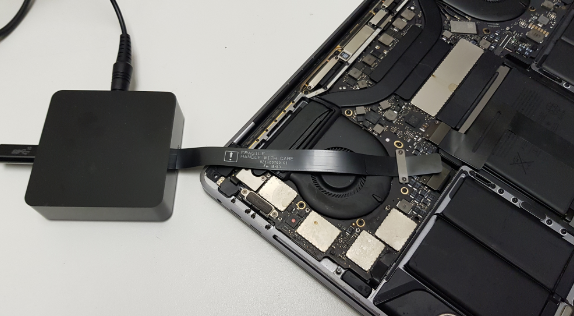 This 2016 Macbook Pro Touch Bar model A1706 is a culprit, having no removable SSD. This client’s Macbook Pro suffered a coffee spill which rendered the machine dead. It wouldn’t turn on or even charge. If it were an earlier model we could remove the SSD, test it and recover the data by using the relevant adapter. That’s not the case with this model. However, a tool does exist which allows us to bypass the mainboard and access the hard drive separately. 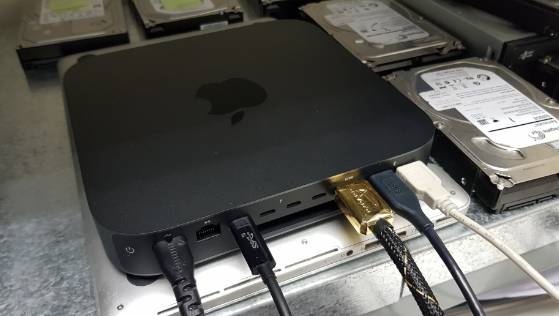 We bypass the rest of the Macbook Pro completely, tap into a special port on the mainboard that connects directly to the internal storage. We do this through a host Mac over Thunderbolt 3. The host Mac, in this case a Mac Mini, allows us to mount the Macbook Pro’s hard drive and recover the data. For this example, we are choosing to recover the entire drive, not just user data, by using the restore function in disk utility. In just under an hour we’ve got a successful recovery of a liquid damaged Macbook Pro with data copied to a new external drive for the client to collect. Do you want to see some more interesting data recovery articles? Have a look here.